Our old bartending newsletter called Bartending…and Beyond! is no longer being produced. If you want the free bartender cheat sheet we used to give for signing up to our bartending newsletter, click on the image below. Whether you’re someone just interested in bartending, currently a bartender or you own or manage a restaurant, bar or nightclub, I guarantee that you’ll take away something that will improve your bank balance or bottom line. Sign up for free to our newsletter to get the latest and greatest in bartending. Bartender basics for the up-and-coming bartender, bartending tips for current bartenders and bar promotions, event ideas, new drink recipes, and staff training for bar managers and bar owners alike. 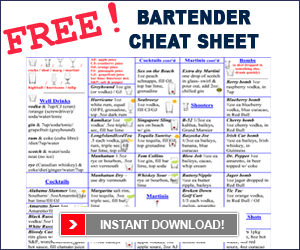 And just for signing up for our bartending newsletter, we’ll send you a free copy of our bartender cheat sheet. As soon you as confirm your subscription, you’ll be taken to a page where you can download the free bartending cheat sheet.